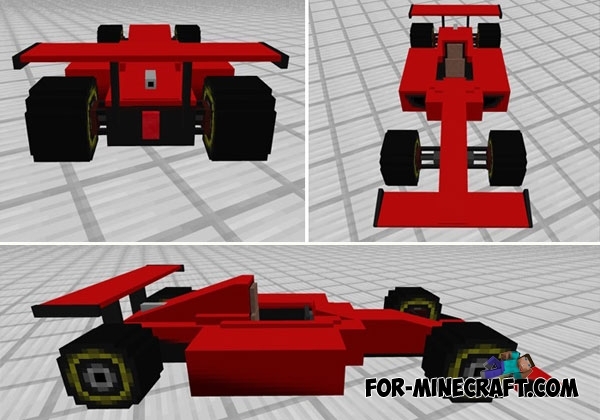 At the moment this is the fastest car in Minecraft PE. Formula one is different from other cars, not only with an amazing appearance but also with ultra-high speed. This vehicle is even faster than Lamborghini for MCPE which you can also download. There are two versions of the Formula 1, which have slight differences in acceleration and speed. Put your friend in the red car, while sit in the blue one and arrange a competition on a racing track. Driving this car is quite difficult in tight spaces. You will need time to learn how to quickly ride and maneuver. For driving you need a car key, although I'm not sure that it is used in real life. Take the key and drive. Formula 1 will start to gain speed and soon you will accelerate to the maximum. 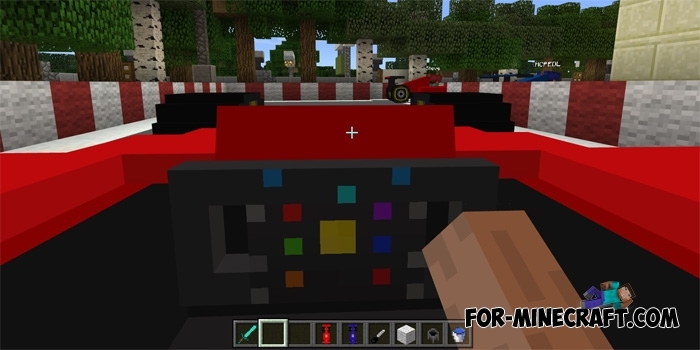 The car is designed for only one player, so install the Formula 1 addon with your friends and turn Minecraft Pocket Edition in a racing simulator.